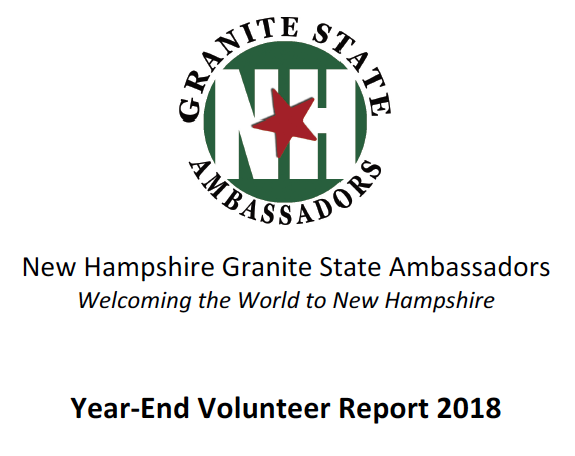 It’s been a productive year (2018) here at New Hampshire Granite State Ambassadors (NHGSA) with lots of new partners and initiatives. Our biggest included the formation of a Strategic Advisory Committee filled with our industry peers to help guide our organization as we move forward with our growth and strategic planning. 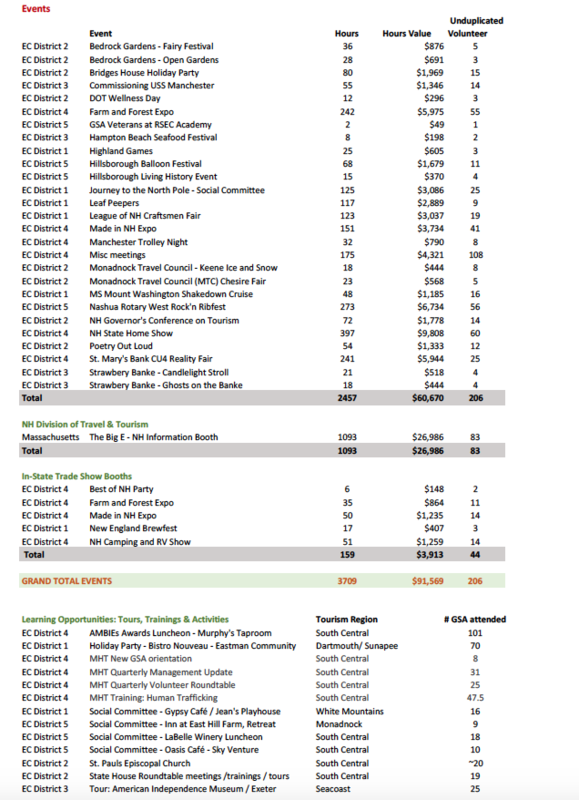 Currently, our modest 132K budget is funded through contracts with the NH Division of Travel and Tourism (NH DTTD), the Manchester-Boston Regional Airport (MHT), our member centers and event services partners, donations and lots and lots of in-kind contributions. The Strategic Advisory Committee, led by our founders, has been tasked with researching and making recommendations for additional revenue streams to counter balance our 2 primary contracts (NH DTTD & MHT). Early in the year we re-energized our Education Committee to develop new large-scale educational opportunities to keep our volunteers at the top of their game. The first is the New Hampshire Advanced Travel Counselor Certification which will take place in late Spring / early Summer 2019. This will be a full day’s educational program followed by a timed, and scored exam. 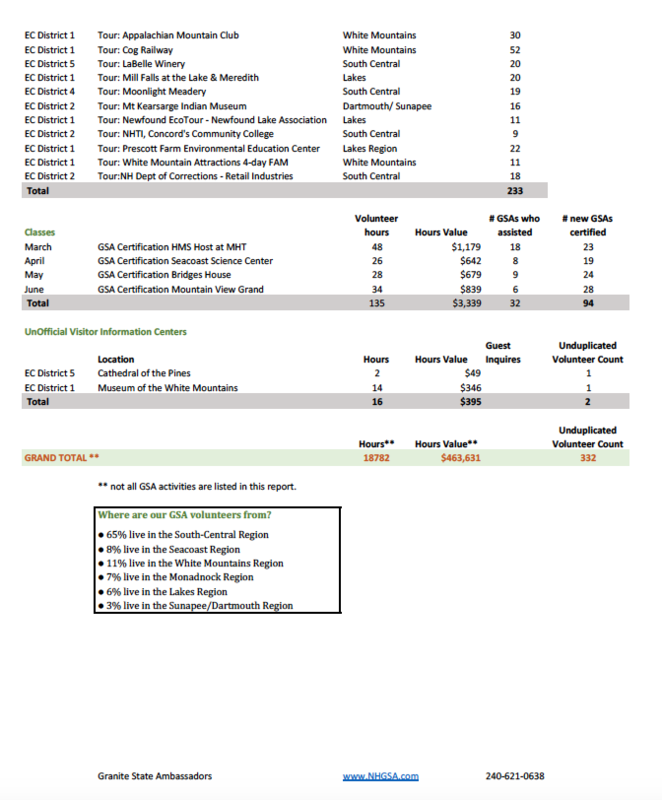 Participants will have to achieve a score of 80% or better to complete their certification. We also developed the Explore NH Passport program. This annual program will feature a new ‘trail’ each year for our volunteers to experience. 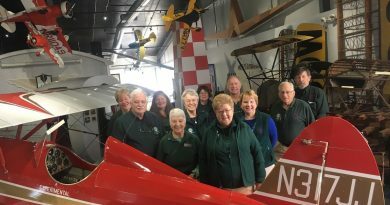 The 2019 program will feature the NH Heritage Museum Trail. Active GSA volunteers can request an official passport card to have validated at each museum they visit. At our holiday party in November, hosted by the Manchester Millyard Museum, the NH Heritage Museum Trail Association will have drawings for tiered prizes supplied by their members, with the grand prize being a 2-night stay for 2 on Star Island. 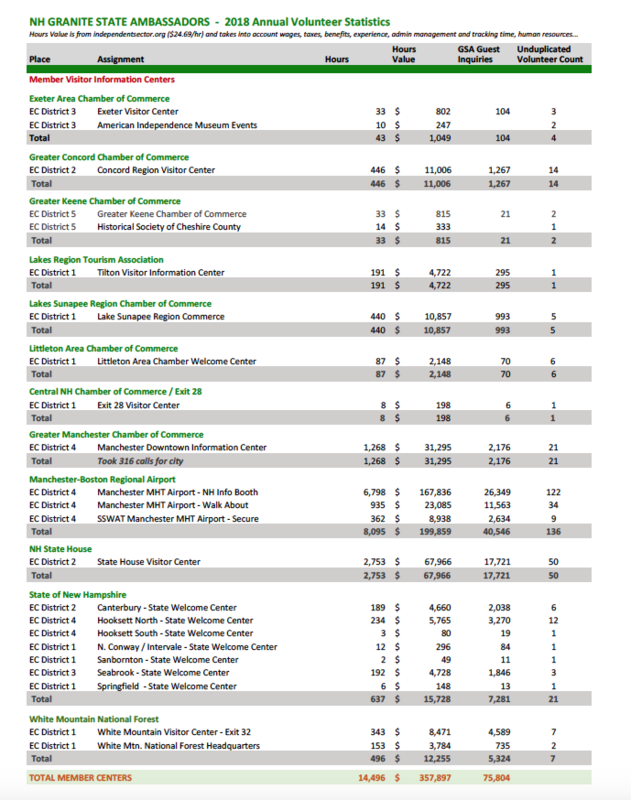 With participation from the NH Division of Travel and Tourism’s welcome center attendants, we are creating one-page Regional Resource Guides. These guides will serve to assist our volunteers in making quality, authentic referrals to guests from around the state and will feature information including historical sites, places to swim, hike, bike, paddle, picnic etc. Watch for these by March 2019. 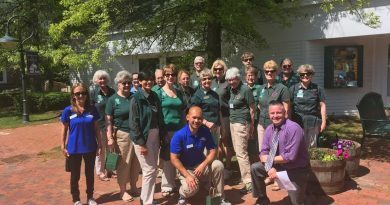 Part of our planned growth is to provide new volunteer opportunities within statewide member museums. 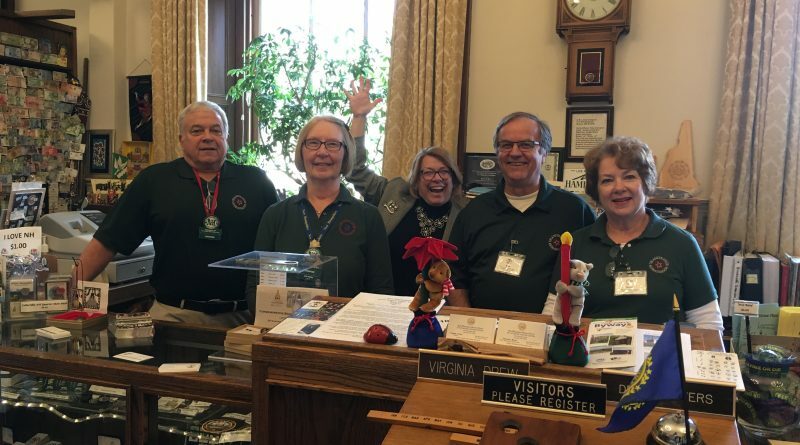 Our GSA volunteers will be able to serve as docents, greeters, and as special event support in participating member museums in addition to being able to volunteer at welcome centers and at tourism related events. 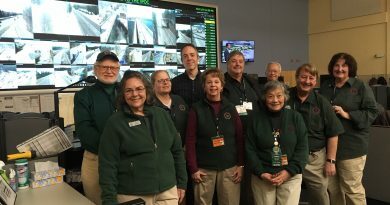 Another new partnership was with the Appalachian Mountain Club (AMC). 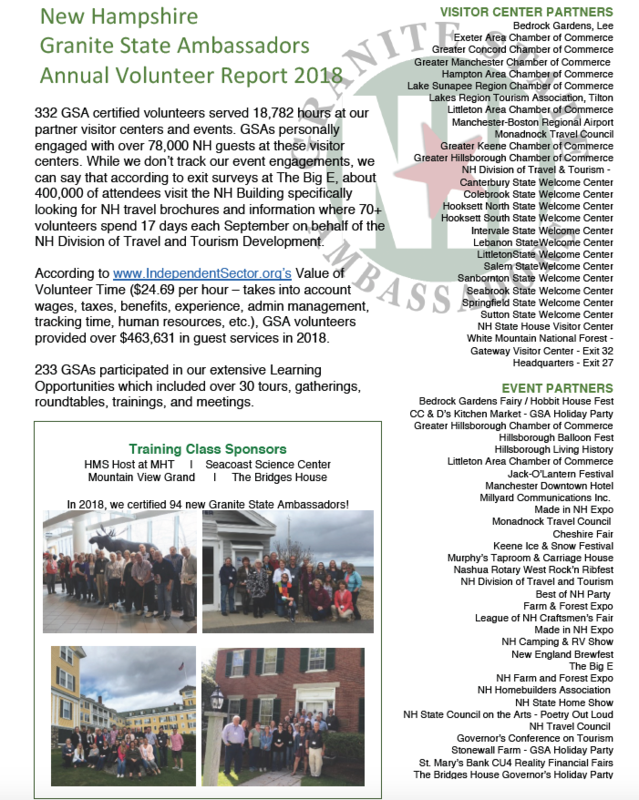 The AMC, along with the White Mountain National Forest (WMNF) conduct annual full-day specialty certification opportunity for our GSAs. These are in addition to the comprehensive White Mountains Attractions Association’s 4-day FAM tour. To support these new initiatives, we welcome new partners, sponsors, and outreach opportunities. 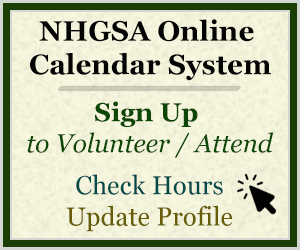 We will again run our June NH Gives Day fundraising campaign and our November Online Auction. 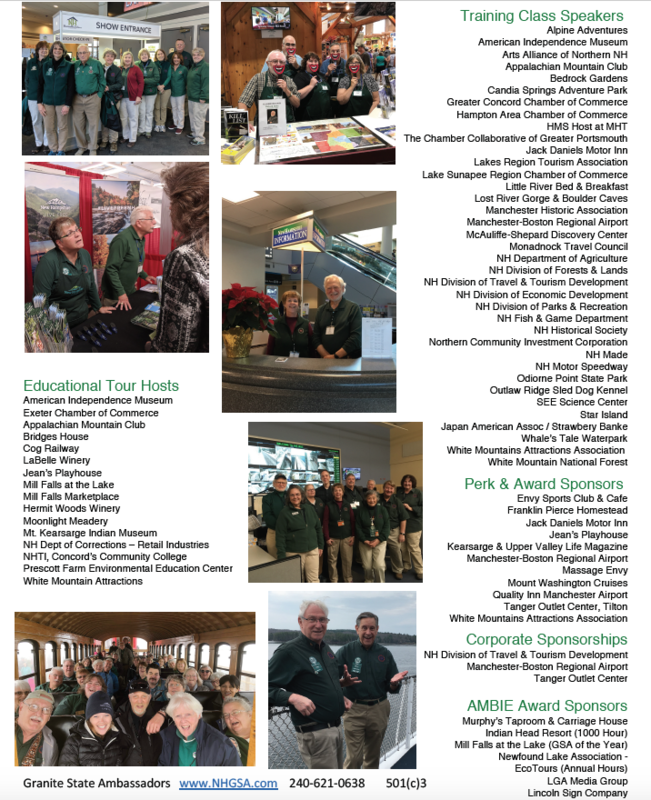 Our outreach efforts expanded in 2018 with a new website, nhgranitestateambassadors.org, award nominations, speaking engagements (to all age groups), workshops, a radio interview, and industry support at events such as the MS Mount Washington’s Shakedown Cruise and the NH Governor’s Conference on Tourism.